Designed specifically for wildlife viewing, the intimate 28-passenger Zambezi Queen made her debut in one of the world’s most captivating places, Africa’s legendary Chobe River. As she drifts along the river, animals perceive no threat, affording you with once-in-a-lifetime up-close game experiences. 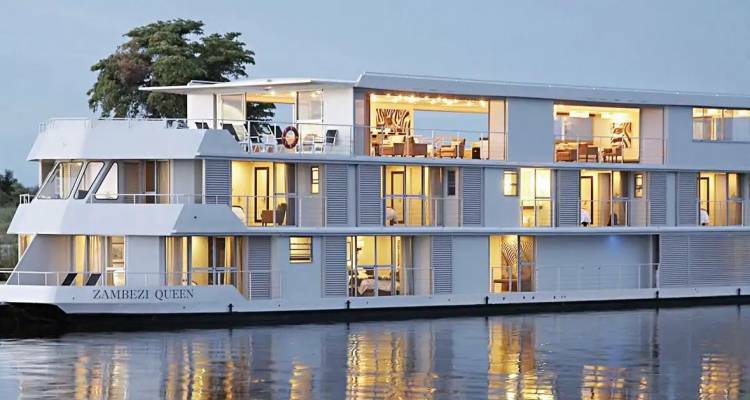 Additionally, to ensure no harm to the environment, the eco-friendly Zambezi Queen uses a water jet propulsion system, fuel-efficient and low-emission generators, and a solar heating system. An enclosed, air-conditioned dining room, lounge and bar grace the top deck, as well as an open-air Sun Deck complete with plunge pool. Suites feature private balconies where you can enjoy unobstructed views of the river and African landscape. Throughout the day, be treated to complimentary South African wines, beer, local spirits, soft drinks and bottled water. And on one special night, enjoy an African-themed dinner with traditional dishes and entertainment. Public Spaces: With panoramic floor-to-ceiling windows throughout the boat, everywhere you go you can take advantage of magnificent wildlife viewing. Eco-friendly boat: To preserve its wildlife surroundings the Zambezi Queen was designed to be environmentaly friendly. Impeccable Service: Our professional and friendly staff will make your cruise a truly unforgettable one. While on board the Zambezi Queen, our guests will dine in absolute opulence whilst taking in the unique African surrounds. Situated on the 3rd level, the dining room offers unobstructed views on three sides. Experience delectable dishes such as butternut and macadamia soup and fillet of beef with bordelaise sauce paired with the perfect wine.